Below is what a Jerusalem Artichoke flower looks like, which is a sign that the tubers below the surface are close to collecting. This plant can grow to 3 meters and with those flowers has been a highlight of the garden for the past month or so. Way back in December, this plant only hinted at the beauty it would become, but well worth the wait don’t you think? I like to grow Jerusalem Artichokes in a barrel or container, and in this case using a half clay pot that will keep it growing where I want it to. Their growth rate is such that without keeping those tubers in a confined space, the thing would soon take over my garden in the same way that the pumpkin did over the Summer. Methinks there is little difference between a super aggressive/productive plant and a weed! Those lovely dark yellow flowers stand well above any other vegetable plant in the garden. I say that because the Magnolia behind it stands at least 50 foot and has its own impressive flower show. This plant has served me well and is now ready to be pulled up, and that is good for a couple of reasons. One being that Jerusalem artichoke leaves are safe for compost, along with the stalk. And one of the other reasons is the resulting crop of tubers! Several box loads of tubers were pulled from the ground, enough to spare to family and the local fruit and vegetable shop. I’ve also kept a few for the next crop, and am now storing them in a paper bag of lightly damp wood chips. And here we go with slices of the tuber that have been lightly fried and soaked on a napkin. 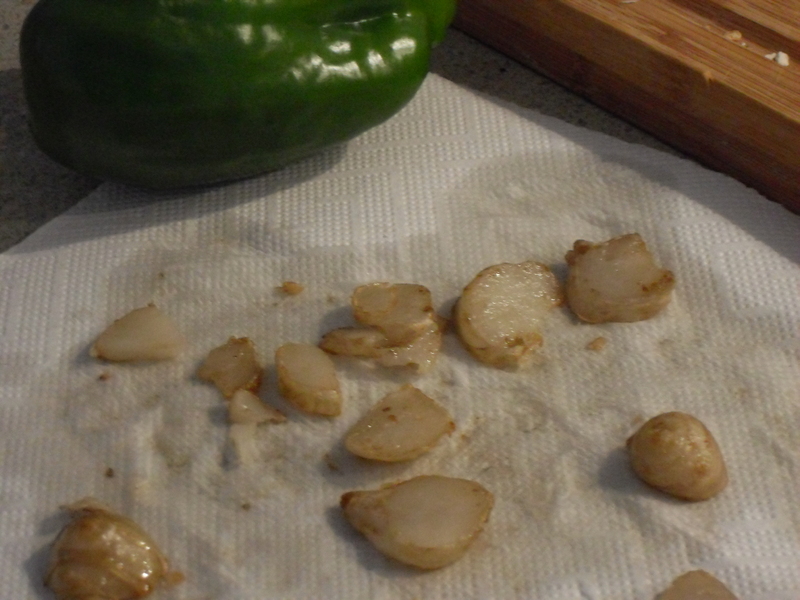 The green pepper is from the garden also. Excluding the eggs, this humble Man Slop is all from my own garden – Tomatoes, parsley, mint, rosemary, green pepper, and string beans all benefiting from coffee grounds being used as a fertilizer. And having forgot all about the carrot that I pulled the day before, there was still time to take some off that also. 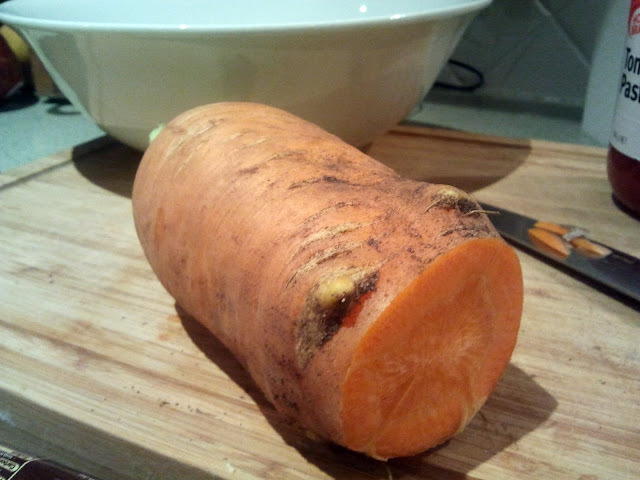 One of the first carrots that I’ve grown, and it seemed healthy enough in a coffee compost for the past 4 months. What kind of meals are you making from your home grown fruit and vegetables? Tags: coffee grounds, garden, green pepper, Jerusalem artichoke, mint, parsley. Bookmark the permalink. I didn’t realise how invasive jerusalem artichokes can be. I have ended up with them everywhere in two of my vegie beds. A good idea to confine them to pots. I make soup with mine. I try and have an ‘at home’ day the next day. They are very invasive which is also why they are such a good crop. As long as you can control where they are growing it is all good. I have a book (a taste of the unexpected), that describes them as the ultimate perennial, because you never need to worry about getting a good yield from them once they are established. Amazing plants! And that carrot looks HUGE. I’m definitely going to have to start putting coffee in with my compost. I don’t drink it that much, but I’m going to start just to have the extra grounds to throw in the compost bin. A big thanks to you Mr Salad. Great to hear that you want to start collecting coffee grounds for your own garden. You wont need to drink it all – just collect from your local cafe or at work. Best of luck with it mate. Fantastic submit, I absolutely love your stuff. Thanks Hailey. I hope you are finding joy in the garden.